Working thread, located on the left index finger of the hand is caught by a hook (and the hook must be entered under the thread on the right side) and jumped on him. Then, the hook is rotated downward and to the right, so that the thread wrapped it up and its ends intertwined. After that first primary loop is ready. On the index finger doing two ringlet of work line. 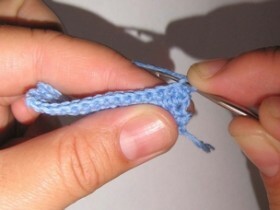 Then carefully remove the rings and adhere to their place of connection between two fingers of the left hand. 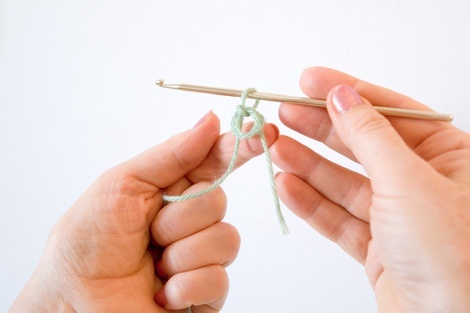 In the right hand take the hook, vdevaem it to form a circle and pull it out of the loop, then through the loop pulling new, fixing, in this way, resulting ring-loop. According to the second method in the first place is the initial loop, but so, to the end of the work line was long,. Then thread, leading to tangle, jumped on the index finger of the left hand, and the remaining long end, starting from the bottom up, on the same hand, wrapped with two fingers ring and middle. Then, with the initial hook eyelet must enter a circle obtained , pull through a working thread and pull it through the loop on the hook. After which the resulting sliding loop is removed from the ring and middle fingers and a bit of the end of the thread is pulled to the right size. The finished moving loop provyazyvayutsya bars without sc, or any other, and at the end of a series of tightening the noose usually pull, pulling the thread end, not to leave a gap in its middle. air hinges They are part of the chain knitting initial, and with their help vyvyazyvayut variety of complex patterns. They made very easy. 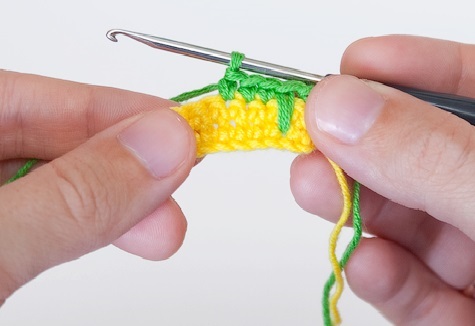 In the case of knitting braids, which is the beginning of knitting, first is the initial loop, then the worker thread for easy provyazyvaniya jumped on the index finger of the left hand, and then captured thread hook and an eyelet is passed through a first. Likewise made and following aerial chain loops. lifting loops. These loops are the same aerial loops. They provyazyvayutsya at the beginning of each row to lift the. This is to ensure that future web has a smooth and beautiful land, and not tilt to one side. Elongated loop or long loop. 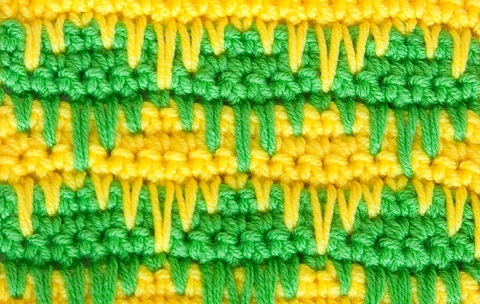 These loops are most commonly used, as decoration articles, as a border or fringe. With the help of long loops can make a pompom, In addition, they are often used in knitting toys, rugs and even knitting sponges, and if you do them with a fixture in the web, the loop will act, as a component of various interesting patterns. In this way, elongated loops can knit, both at the beginning and end of the web, as in any other part of his. For the first method loops are loops of products. At the beginning of the chain of air, and in the middle, eg, of the loops of a number previously associated blade. Let us consider, how it's done. 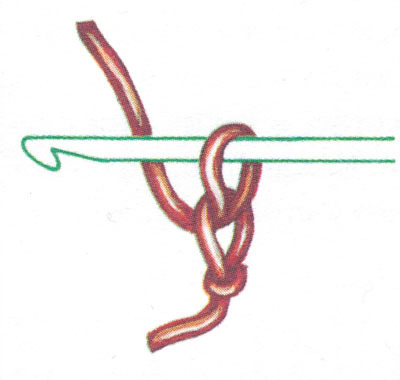 The hook is introduced into the loop of a selected number of the web and through it stretched loop, after which the thumb of the left hand rub the working thread and the hook is put on a finger loop formed, as if clasping her and then threaded into the fabric, from which it is drawn a new loop. Then all three loops, are hooked together provyazyvayutsya, and stretched thread with the thumb leans toward. For the second method it is necessary to prepare a cardboard, width equal to the length of future elongated loops, and the length, the size of the product. After that the working thread first jumped on hook, and then from the back side it is necessary to embrace cooked cardboard strip. Then sc hook is inserted into the loop fabric and pulled out a new loop. On a working thread is trapped again next step hook and pulled through the loop and sc, are on the hook. Likewise provyazyvaetsya whole number to the end, then finished long loops are removed from the carton. Elongated loop can also be done with fixing it into the lower ranks of products. Such loops are best done from a thread other than the main fabric color. The algorithm loops of knitting next. A number of other color starts provyazyvatsya. One column or more, without sc, depending on the pattern, you need to knit in the columns of the previous row, then working thread a little bit stretched for knitting long loop, hook and loop fabric in vdevaetsya, located a few rows below and pulled from it a new loop, which is tightened at the height of the upper row. Then, the working thread crochet captured and pulled through the two loops are on the hook. Further knitting proceeds according to the selected pattern. 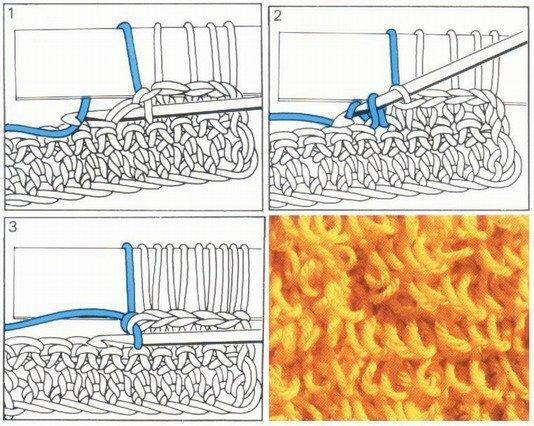 With such a method with fixing knitting loops, you can knit products with beautiful patterns. We are making the initial loop, whereupon therefrom pulling eyelet elongated. Loop is pulled through elongated loop of conventional size. Then the hook is introduced into the long loop and through the second small loop is pulled. Then, the working thread crochet captured and passed through two, educated on the hook thread and re-drawn in a long loop. In this way, is knitted chain of the desired size. The next series is as follows. 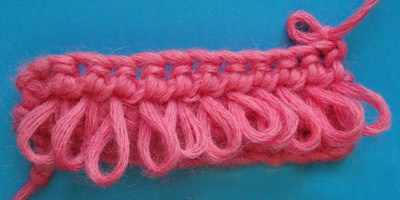 To raise the number of loops is knitted two Solomon, then introduced into the two hook tabs nodule, connecting the elongated loop is knitted and from one column, without sc, from which it is drawn a new long loop. After that is knitted two more loops Solomon, and then they are fixed, knitting column without sc, next through a coupling assembly of the previous row of elongated loops. In this way, Solomon knit loop need to continue until the desired size of the canvas. 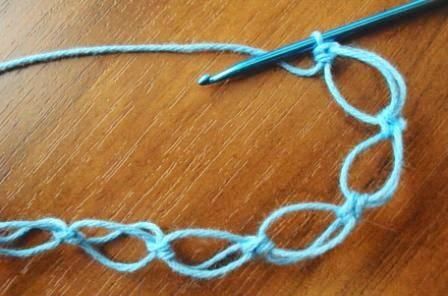 All of the above loop, apart elongated and Solomon, are the basis of, or the basics of crochet, so for all beginners to master this type of needlework it is very important to first learn their vyvyazyvayut, better yet, if trained to do them.